We are a 5-8 division of the Linsly School, which recognizes how incredibly important the middle grades are in the academic and social development of young adolescents. 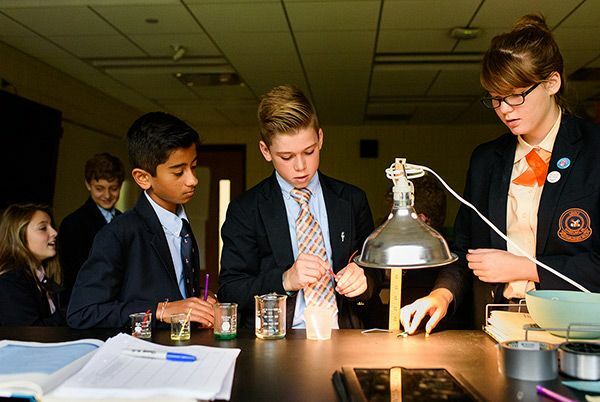 The middle years are a critical time in the identity formation of each student; therefore, character development, in addition to a rich and rigorous academic program , is an integral part of all educational endeavors at the Linsly Middle School. Linsly Middle School teachers know each student on a personal level and the success of each student is the ultimate goal. 8:00 - 8:10 AM - Middle School students meet in an “Advisor Period” every morning. The Advisory program at the middle school is one-way middle school students are supported for success. Advisors help each student set academic and extracurricular goals and many advisory groups engage in community service activities or campus initiatives that extend beyond the school day. Each student is assigned to an advisor in his/her first year at Linsly. After their first year, students get to select an advisor with whom they have developed a special connection and/or whom they feel can mentor them best. 8:10 - 3:00 – Linsly Middle School students move through 5 academic class periods each day that last 70 minutes in duration. The longer periods allow for more depth of instruction and provide opportunities for a variety of educational activities to engage students in active learning. Teachers mindfully design lessons in their content area that incorporate the 8 characteristics of an engaged classroom: movement, problem-solving/critical thinking, student participation, individualized instruction, real-world connections, student collaboration, varied activities, and alternative assessment. Teachers plan cross-curricular lessons as well as field trip experiences for students at each grade level in the middle school. In addition to the core subjects, each year of the middle school curriculum includes a course in Health/PE, Art, Music, Performing Arts, and Foreign Language. 3:00 - 3:30 – Linsly Middle School students are dismissed from class at 3:00, but for most students, their day doesn’t end there. In the half hour immediately after school, students are encouraged to seek extra help from their teachers. They may also go to the library to study or work on school projects with their peers. There are a variety of middle school sports teams each season which practice and compete after school and the Williams Art Center is also open to students who wish to pursue art enrichment. Cultural Experience - Linsly Middle School aims to prepare all students for participation in a global society. 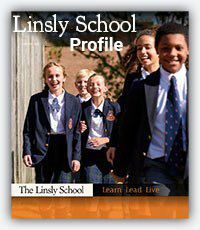 The Linsly School admits students from all over the world; in fact, 20% of Linsly students are international. Middle school students learn about language and culture within a variety of exploratory language courses. By the end of middle school, Linsly students will have completed courses in Multicultural Language Arts, French, Spanish, German, and Latin. In 8th grade, students choose a level 1 language in either French, German, Latin, or Spanish. Student Support – Linsly Middle School believes in supporting each and every student both academically and socially. The support begins within the classroom where the average class size in grades 5 & 6 is 12 and in grades 7 & 8 is 15. Small class size allows for more individualized instruction within each course. For those students who need extra academic support beyond the classroom, the middle school offers a peer tutoring program, facilitated by Language Arts teacher Mrs. Loudermilk. Students can be referred to the program by a teacher, a parent, or themselves. They receive extra help from an 8th grade tutor during a Flex period, and their progress is monitored by Mrs. Loudermilk. For students who may need some extra help socially, there is a Peer Mediation program directed by Social Studies teacher Mr. Holt. Students learn how to navigate social situations and how to successfully resolve issues with their peers.